I Am chronicles the journey of an Indian lesbian filmmaker who returns to Delhi, eleven years later, to re-open what was once home, and finally confronts the loss of her mother whom she never came out to. As she meets and speaks to parents of other gay and lesbian Indians, she pieces together the fabric of what family truly means, in a landscape where being gay was until recently a criminal and punishable offence. Sonali Gulati is a busy woman. As well as making several acclaimed short films she is involved in feminist and grassroots activist work and is an associate professor at Virginia Commonwealth University in Canada. Her most recent work, I Am, which has been gathering up awards around the world, is framed by her return to India to confront the loss of her mother, to whom she never came out. By meeting and speaking with other gay and lesbian Indians and their parents, Gulati considers the meaning of family and the role identity might play within it. 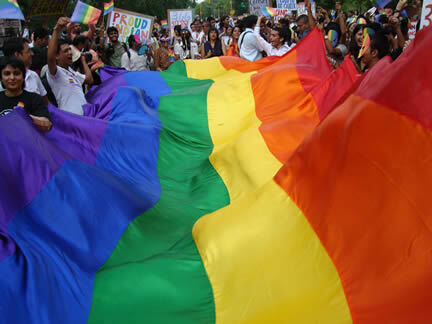 I Am was filmed over the period of time that the legislation making homosexuality illegal in India was being removed from law, and as such reflects a country on the brink of change – this is a story that is by turns unhappy, hopeful, brave, and full of longing for idealised lives and pasts that can never be – by Nazmia Jamal.